The candidate for U.S. Senate in Utah told NBC News that Trump "has departed in some cases from the truth." Mitt Romney, a candidate for U.S. Senate in Utah, said in an interview Monday that President Donald Trump is not a role model for his grandchildren. "I don't think that I would point to the president as a role model for my grandkids on the basis of his personal style," Romney said in an exclusive interview with NBC News' Garrett Haake. "He has departed in some cases from the truth, and has attacked in a way that I think is not entirely appropriate." Romney acknowledged that Trump's policies had "been by and large a good deal better than I might have expected," but added that “some of the things he has said are not ones that I would aspire for my grandkids to adopt." Romney's comments come just weeks before a June 26 GOP primary in the race to fill the seat being vacated by Sen. Orrin Hatch. Romney had been an outspoken critic of Trump during the 2016 presidential campaign, delivering a blistering criticism of the then-candidate in March 2016 in which he slammed Trump as a "phony" and a "fraud" who was "playing the members of the American public for suckers." He also appeared to take some veiled shots at the commander in chief in a video announcing his U.S. Senate bid in Utah, drawing distinctions between attitudes in his state on immigration and the president’s policy proposals as well as noting a difference in tone. 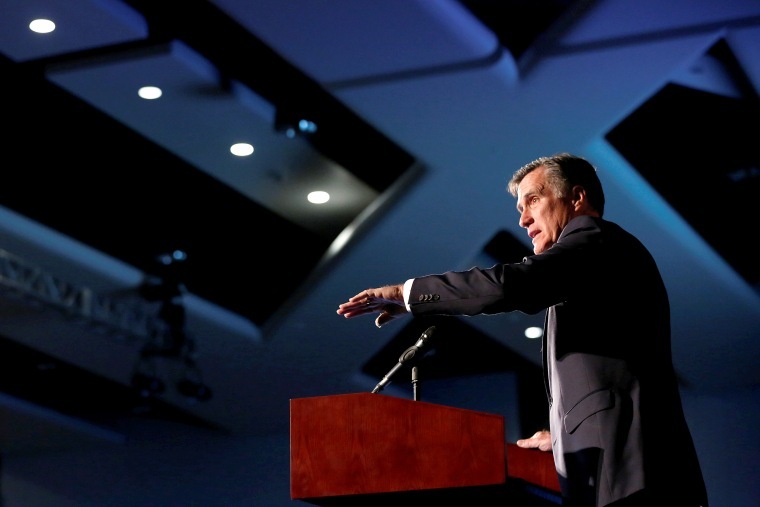 But when asked by NBC News whether as a senator he would be the man "who gave that speech in March of 2016" or "somebody who wants to work more closely with the president," Romney said he would "call 'em like I see 'em." "If the president were to say something that I consider highly divisive or racist or misogynistic, I’ll call him out on it," Romney said. "Because I think it's important for people to know exactly where one stands."